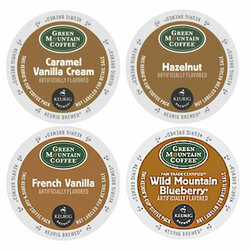 Green Mountain Coffee - Flavored Sampler - K-Cups. A collection of rich flavors to match the different moods and moments of each day. Each box contains: 6 Caramel vanilla Creme, 6 Hazelnut, 6 French Vanilla and 4 Wild Mountain Blueberry. Each box contains 22 single serve K-Cups. Green Mountain Coffee - Flavored Sampler - K-Cups. All of our K-Cups are to be sold in an at work environment.